Zombie running away from Pea shooter! 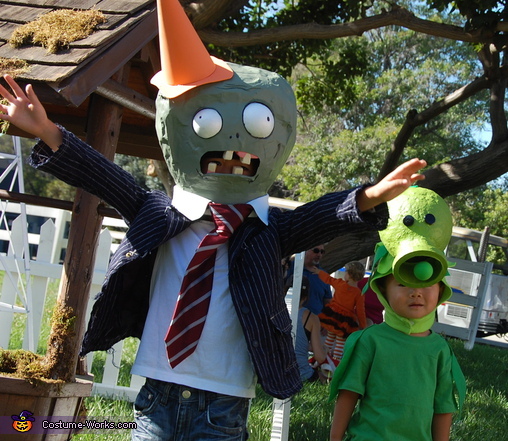 My boys love the "plants vs. zombies" video game so I decided to make their costumes this year. For the zombie: I paper mached a 12" balloon and added dimension by using more newspaper and masking tape. Then I cut out holes for the eyes and mouth. I painted with acrylics and used styrofoam bals for the eyes and a styrofoam block covered in masking tape for the teeth and gums. The cone is made out of foam sheets. I glued an old shirt collar and tie to the neck base and used an old jacket and ripped jeans to complete the costume. For the pea shooter plant: I paper mached a 9" balloon and used a styrofoam round piece for the mouth. I painted with acrylic paint and glued black buttons for the eyes. In order to keep the head on a two yr old, I sewed a head piece out of felt and then glued the pea shooter head to it. Can I buy these masks from you? Are you interested in both the zombie and the plant? The Zombie mask can fit a 6 year olds head and the plant fits a 4 year olds. I'm also willing to buy the pea shooter! I'm so not crafty and 4 year old wants it! Are they for sell? I want to buy both. My kids love this game! Are these for sale I would love the Pea shooter! How much are you asking? My son is 4! My son (who is 6) wants to be the pea shooter. How much are you selling them for? 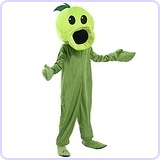 hi i was wondering if the Pea shooter costume is for sale? I agree, the best pea shooter I have seen so far! Thanks for the inspiration. 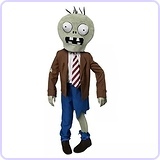 My 8 yr old is going at the football payer zombie and has convinced his little brother (5yo) to go as a pea shooter. Can you clarify what the Styrofoam round piece is? I'm on my second attempt to make this for my son. Could you please send me the instructions on how you make the pea shooter? Are you still selling these costumes? I would also like instructions? Where did you buy the styrofoam? Or, if you make and sell. 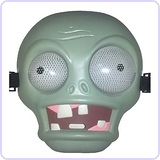 I would really like to buy a zombie fit for an adult and a peashooter fit for a four year old.